A good quality paint sprayer can make all the difference in your DIY painting projects. To make choosing a sprayer convenient for you, I have tried and tested many spray paint guns on the market. This is the complete paint sprayer reviews guide with tips, tricks, and advice related to painting. Traditional paint brushes and rollers get the job done but the time commitment and physical effort make paint spray guns the smart and sensible solution for home or DIY use. Sprayers have their advantages and have gained popularity. When using a paint sprayer for the first time, you suddenly realize that they are very reliable, easy and efficient. Most models come with simple instructions on getting started, produce a regular flow of paint and will produce even coats on which surface you need covering. Before reading anything else, check the comparison chart below for information on some of the top models on the market. The sprayers people mostly use contain an air compressor. Many homeowners will already have a compressor in their possession so only buying the gun can be a relatively simple choice. A complete spray paint system comes with a nozzle, trigger, paint tub, hoses, and more and is set up and ready to use. Both of these types are outlined below. Air spray systems are built so that compressed air helps to inject it into a fluid stream of paint. This helps achieve atomization and an even flow. The paint is usually held in a paint cup attached to the spray gun. These are often referred to as gravity, siphon or pressure feed spray gun systems. Have become cheaper and easier to use in recent years. The ‘airless’ nature means that airless spray atomizes, splitting into tiny droplets without needing to use compressed air. The next step is that fluid is pumped with high pressure and comes out in the spray tip. Different pressures and tip sizes will alter the material’s rate of flow. A fan can also be created by the tip. These tools are ‘all-in-one’ paint sprayers with easy set up means you can get spraying very quickly. Most tools allow you to spray directly from a paint bucket or paint can. Sprayers of High Volume Low Pressure are known as HVLP. Exactly as their name describes, a high volume of paint can be sprayed at a consistently low release of pressure. A big advantage is that these tools utilize almost 80% of the liquid with just 20% becoming waste. Other machines can produce a lot more waste. HVLP systems can be built for both smaller and larger jobs. Wagner sprayers are great for small DIY jobs while Fuji has developed excellent larger models for tasks like painting a car. This is another recent addition to the market and these paint spray systems of good balance without the power of other models. They are designed so that less air is used to atomize the cap at the top of the gun. These machines can be very effective spraying small, intricate paint job. Other categories gaining traction in the paint sprayer space include handheld models that can be both electric or cordless/battery operated. Find out more about these styles in our complete guide here. To help break things down further, I have reviewed and recommended for various categories including type of paint sprayer and depending on which painting job you have in mind. It is important to consider your own budget when looking at purchasing a paint spray system. Another important factor is the projects you will be working with. For example, spraying the interior or exterior of a house is different to refurbishing furniture with a new coat of paint. Some people want an all-purpose spray gun for home use. I have featured my favorite all around gun below. 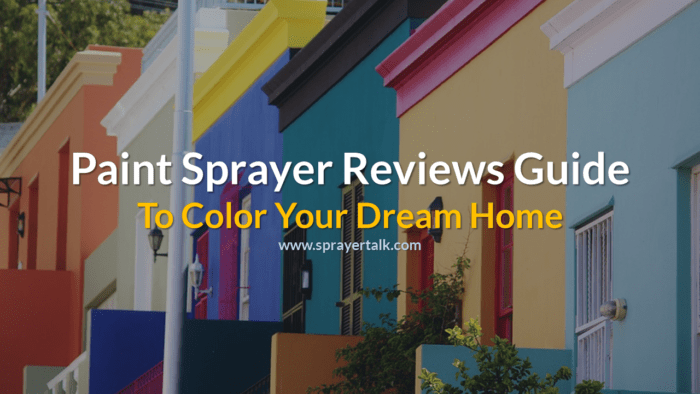 Sprayertalk is here to help by providing in-depth paint sprayer reviews. Our guides help educate beginner painters and also assist expert professionals with their choices. Painting your home can seem like a daunting task. Not anymore! I guarantee that using the best paint spray gun will get the job done and save you money. Anyone can use one too, so don’t be alarmed if you are a newbie! Any of these 11 are sure to provide a comfortable painting experience and quality outcome! They all provide value for money but are suited to different jobs and budgets. Each paint sprayer on the list has thorough review below and also a dedicated page with an even more comprehensive guide to its capabilities. The Magnum X5 is manufactured by Graco and holds #1 position in my view. It is undoubted, the best paint sprayer of 2017. It has the specifics of a professional sprayer but is lightweight, user-friendly and perfect for homeowners. I recommend this spray painter for its multi-purpose use. It is the best airless electric paint sprayer without any doubt, covering basically any DIY paint task. Graco is one of the leaders in this industry with its tools always held in high regard. This American brand is one you can trust and rely on. If you are searching for a paint sprayer that will work effectively on a budget then the Wagner 0518050 HVLP sprayer is for you. This product comes in my top 10 best paint sprayer list because of its quality and value for money. Being a HVLP spray system, it works on low pressure meaning less overspray. Furniture, kitchen cabinets, and fine finish spray jobs will be made easy with this super system from Wagner. Wagner, along with Graco, is another of the industry leaders. Their spray guns are extremely popular, lightweight, and built for the home handyman. The Graco 390 is a solid piece of equipment built for repeated use in a vairety of settings. It is lightweight and portable at just 30 pounds. Because of the ease of lifting and carrying it can be taken on most any job site with you. The ‘stand’ aspect is one of my favorite features. The RAC X515 SwitchTip also makes it easy to keep working in the event of a clog. Simply reverse the tip and keep spraying. Ideally, this sprayer would be best for a professional contractor/painter who regularly needs to spray materials for their job. It offers a quick and easy setup so you can get to work faster. With the ability to spray up to 0.47-gallons per minute. This is one of the most efficient models on the market. The Graco 390 is capable of handling most of your indoor residential painting jobs. 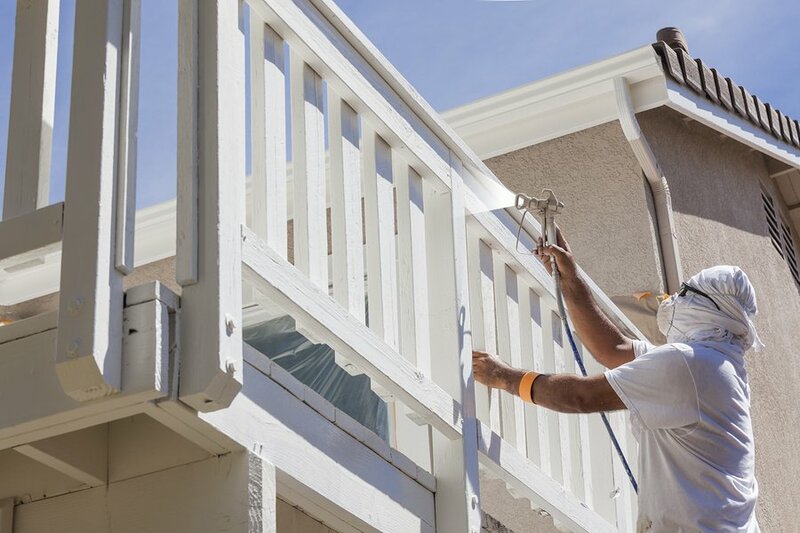 In addition, the exterior of your home always needs some work! Consider using this sprayer for the house, garage doors, fences, and is a great tool for commercial painting jobs and property management. It has the capability to quickly get through projects with ease while being able to perform for years to come. For smaller projects, HomeRight products work very well have gained popularity. This model, the HomeRight C800766 is user-friendly that works with excellent variety for an electric hand-held spray gun. 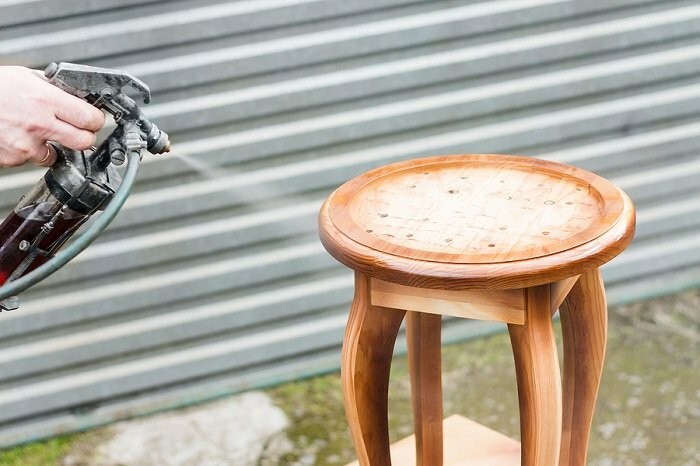 The 3 different spray patterns allow for excellent coverage of chairs, tables, and other furniture pieces. Cabinets can be sprayed with ease too by this little gem. Another excellent choice for small jobs and a great addition to your tool collection. For bigger projects, it might not be the best option. Wagner 0518080 Max HVLP Sprayer is one of the most recommended spray guns by Amazon buyers. This item meets the needs of homeowners who want versatility and value! Wagner has always looked out for mums and dads who want quality at an affordable price. This model has a few more features than its little brother ( the 0518050 – see below), with three different spray patterns and more power. This is my go-to gun when I need to get the painting task done quickly! Another familiar brand, the Wagner 0529021 Flexio 890 is one of the best products released from the industry giant. This sprayer has superb efficiency and performance. Extra advances in technology mean extra features with this tool. The iSpray nozzle and X-Boost turbine mean paying slightly more than others in the Wagner range. Overall, the Flexio 890 is Wagners best sprayer for most home owners. Earlex HV5500 Spray Station is highly recommended product for anyone who is looking to spray small to medium painting tasks. Its professional look and features including the versatile spray patterns help make it a top 10 choice. The unique spray gun and needle set allow for maximum control and portability. It works fantastically well with wood and is classified as a professional HVLP machine. The ease of use will have you thinking otherwise. Another quality Graco product, the 257025 Project Painter Plus is the perfect tool for jobs around your home. This lightweight and portable equipment come fully assembled being ready to use. Graco has designed this spray gun specifically for ‘projects around the home’ with fully adjustable pressure and a switchtip for easy use. This is the machine for a serious home DIY enthusiast who wants a professional finish. The Wagner Power Painter is another magnificent product from the Wagner. This handheld and airless kit enable you to manage any kind of project with ease. Spray up to 8.0 gal paint per hour which will let you paint four times faster than any brush or roller. Being airless, this is a step away from Wagner’s usual range of handheld machines. It is still made with quality so if you are happy with Wagner then I recommend sticking with them. The Graco Magnum X7 is another top quality airless paint sprayer available at a reasonable price. It features an auto primer, SG2 metal spray gun, and 5 gal capacity. These make it suitable for any kind of home painting project. Magnum x7 was produced for the serious DIYer who is looking to spray medium to large sized areas. It is a complete spray gun system and worthy of anyone’s top 10 list. Especially considering it comes in at a reasonable price for the quality it provides. The Wagner 0529010 Flexio 590 Indoor/Outdoor Hand-held Sprayer Kit is one of the best cheap options from Wagner. It is suitable for many small-medium types of projects. Adjustable control system and multiple nozzle options allow for excellent control from a more affordable model. Smaller areas of interior walls and fine finish jobs such as furniture are its specialty. And of course, being part of the Wagner flexio range, it cannot be ignored. By now I hope you are gaining a better understanding of what to look for when buying a paint sprayer. Let’s take a look at the top paint spray companies in the market and see how they compare. Many users agree that when it comes to airless, high-quality sprayers, Graco comes first. The technological advances implemented in their range have allowed DIYers to produce professional results. The best products of this brand include the Magnum X5 and X7. To find out why just read our Graco X5 Review. Graco doesn’t stop there with excellent guns in the handheld electric, handheld battery and commercial ranges. Read all about Graco’s extensive range here. Wagner paint sprayer is one of the best-known producers of paint spray guns. Their HVLP systems provide solid results for small-medium jobs with the Flexio range being superb value for money in my opinion. Read our Wagner paint sprayer reviews to know how good they are. The Wagner range is vast with airless, handheld, commercial to novice all covered. As one of the leaders in the airless technology, they offer a great line of sprayers which will satisfy the demand for any serious sprayer. You can easily find their best products available in the market by reading our Titan Paint Sprayer Reviews. Recently Titan has extended their range of airless to rival Graco. They have products for both the professionals and less experienced home users with all sprayers resulting in a professional look and finish. Campbell Hausfeld has a paint sprayer range from general use to gravity feed HVLP spray guns for professional use. Their quality is undoubted and the guns they have on offer work extremely well with air compressors. Campbell Hausfeld offers a variety of sprayers which can be used for painting your car to painting kitchen cabinets. Read our Campbell Hausfeld Paint Sprayer Reviews to understand which will work best for you. Earlex is one of the leading providers of consumer & professional machines. Over the years they have created a large group of followers from their reliable products and service. The 5500 spray station is their signature tool with customers raving about its features. You can find all about this product in our Earlex HV5500 Spray Station Reviews. Fuji are leaders in the high-quality HVLP or gravity feed department. The Semi-Pro and Mini-Mite series has transformed the ease in which mums and dads can spray anything. Read about all Fuji Sprayers here. They are superbly built and excellent for restoring automobiles, large projects or just about anything. Fuji may be a little pricier than other brands but quality, durability, and flexibility are all assured. Alongside the above brands, other quality models are also available with top such as Ryobi, Rockler, Bosch, Black & Decker and much more. 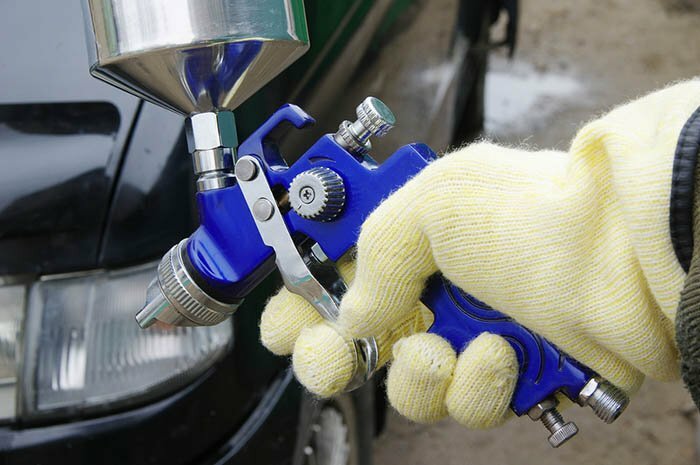 Before you purchase your next spray gun, you must get familiar with some basic requirements and options. This will enable you to pick the highest quality and best paint sprayer. Some of these aspects might be new to you, especially without prior knowledge in the painting field. Don’t worry, my simple guide is designed to help both the experienced and novice painter. Having the right accessories on hand will save you hours of labor and allow you complete the project in a professional way. Let’s start by figuring out how to select the best paint sprayer. Below you will find an image from Graco that can help you to understand what gun is needed. Keep in mind that HVLP sprayers can be included in spraying automobiles. Many people will automatically assume that more pressure equals the best paint sprayer, but that isn’t necessarily true. Yes, higher pressure paint sprayers will get the job done quicker. It will produce thicker layers of paint as more paint is pushed out of the nozzle. Not all jobs are going to require that much pressure. Some tasks will benefit more from a steady and weak stream. It all depends on how much control you need for the job you are performing. This is your gauge to how powerful the engine is. It plays hand in hand with the pressure of a unit. You need horsepower to produce the pressure for the paint to come out of the nozzle. Again, only choose a sprayer with the horsepower you are going to need. Choosing the right spraying tips can play a big part in the outcome of your project. Each tip is measured in inches, therefore, a .10 tip means you are using a tenth of an inch. Measurements listed as 515, you would take just the last two digits of the measurement. The first number is the width of the spray pattern. This is an important factor if you will be painting a job that requires distance. You can choose a sprayer that has a long extension cord or a long, flexible hose. Have a longer hose also enables to reach higher and further while painting. Paint sprayers can be lightweight and portable or heavy-duty. If you are going to be doing small projects and want to take the sprayer on the go, a lightweight option will be best for you. When focusing on larger tasks, then the heavier option will be best as it generally will have larger containers, stronger motors, and more accessories. Paint sprayers range in price just like every other item that is sold in today’s market. There are many choices and brands available to you at any given time. Weigh up the costs versus with how many years you will be able to use the sprayer. This will help you break down the cost of a model and see the value behind it. Remember, not everyone needs the expensive, professional models. Take this into consideration when looking at the different prices of paint sprayers. GPM is the term that measures the volume of a paint sprayer. GPM stands for gallons per minute. This is how much paint you can transfer from your bucket to the surface within a minute. Higher volume sprayers normally mean more coverage and a faster job. If you are looking to get a larger sized job done quickly, you’ll want to look for a paint sprayer with a large volume. The recommended annual usage is a general guideline offered by the brand to help you understand the rating of the paint sprayer. This is just a guideline, however, as regular maintenance and good care will help your sprayer last longer. The performance rating will be measured across the different brands. It will analyze the performance of the machine relative to a standard performance. This can be a helpful tool when deciding if a sprayer is right for your needs. 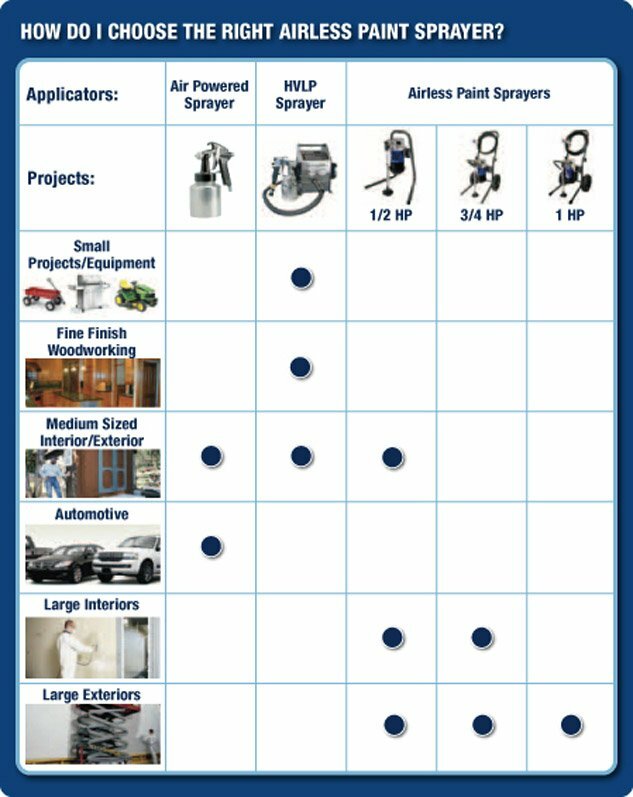 All of these factors will need to be looked at a whole when purchasing the best paint sprayer for your needs. First, determine the jobs you will be using the sprayer for and then go down the list in the buying guide to determine what you need. Then, you will be able to effectively choose the best sprayer for your job. Finally, to select the perfect paint sprayer, make sure that you have considered the following points. The will help you choose the right one for your needs. Consider a model which has wheels or comes in a backpack as the ability to move around easily is underrated. Pressure regulators are excellent features for pressure control. It will definitely give you the freedom to choose between different settings like rolling, cleaning etc. Using a tip extension is great for painting the high ceiling or places which are tough to reach. Make sure you have a flexible hose of minimum 25 feet long. It will definitely help you in jobs like painting the fence. Capacity or volume should suit according to the demand of your job. Check whether spare parts or replacement are available. A paint sprayer may sound easy or look simple to use in youtube videos. Unfortunately, you will not just be able to hook the sprayer to the color and begin painting. You will need a little bit practice before you start doing your interior or exterior. It is always a good idea to practice on a cardboard first. After a few practices when you will feel sure that the coverage is even and of the correct consistency. Then you can move onto the real painting job. As an alternative, you can consider using a professional to get the job done. Roof restoration is an example of where a licensed contractor is a good idea. We have listed a few tips for you to follow for an efficient job with a spray paint gun. Clean the work area before you do the painting and most importantly clean the surface where you will color. Check the air temperature. If it is above 85 degrees or below 45 then do not paint. Because the paint will dry too fast or of it is too cold then the paint will not dry properly. Cover the areas or things where you do not want to be painted. Airless machines can emit large amounts of overspray. Cover yourself with protective gear and safety footwear. To prevent the clog, stir the paint well. Keep in mind that clogging the main problem when it comes to doing a painting job. When you are about to start the painting job. At first, start to move the gun and move it in long, clean and straight strokes. In order to get even coat do not apply several times in a single place. Keep moving. Always keep a constant distance from the surface. Try to hold the nozzle straight and keep a steady hand. We have a separate writing on how to use a paint gun in our Tips and guide section. Anyone interested in how to use a paint gun can check the article. We have also detailed how to spray paint a car at home which will guide even the most beginner sprayers in coating their automobile. Like all products, there are also positive and negative sides to using a paint sprayer. You have to consider the method you are following when spraying and your experience. After all, it will be you who will be spraying the paint, so the outcome will certainly depend partially on your capabilities too. Here are a few more points for the positive and negative sides of using a paint sprayer. Less time will be required to do the job. Cost effective as you can do the job alone or with family. Getting an even coat of paint is easy to do. The process is very much labor effective and you will have the control of the painting process. The painting job will be less messy and less equipment will be required to do the job. Easy to use to seal the gaps or cracks on the wall, where using a painting brush is difficult. Cleaning the kit after the painting job is also easy. Using a paint sprayer is not suitable for all kind of surfaces. You have to be some understanding of how to use sprayers for painting. Some machines are quite heavy and can be difficult for newbies to control and use them. Using a paint sprayer is not always good if you are refurbishing a very small area. If you have come this far and are still in need of the best paint sprayer then do not fear. We recommend you to select the Graco Magnum X5, as it is long-lasting, is backed by Graco and was purposely built for the homeowner. Keeping an eye on your budget? Go for Wagner 0518050 Control Spray. These will satisfy all of your painting needs. When deciding to color something with paint sprayers you need to have some accessories for better performance and safety. A well-presented home, freshly painted kitchen cabinets or superbly resprayed car all showcase our personality. We take pride in our appearance and our assets deserve to be treated well too. My paint sprayer reviews offer information, advice, and guidance on what spray gun is best for your paint job. I will be updating my content all the time so that you get the best possible information as technology and products advance.